Dee McDowell (left), who is experiencing homelessness, collects her mail from volunteer Chris Martin at Broad Street Ministry on Avenue of the Arts. Once, she worked in a retail store, and had an actual address. But McDowell, 48, from North Jersey, now lives on the streets and in shelters. Ask what happened and she’ll recite a dismaying litany of calamities: mental illness, abuse, diabetes, and something dreadful about her spine. She’s here awaiting correspondence from her bank. Maybe they’ll replace her debit card, get her going again — back on the grid, back from the nowhere. Currently, more than 3,200 people actively use the mail service at the ministry, which is not a shelter, but offers meals, medical service, and other amenities for the homeless in a large, Gothic church across from the Kimmel Center for the Performing Arts. Last year, ministry volunteers handled 154,000 pieces of mail for guests, as they are called. It’s not uncommon for individual shelters to accept mail for clients, experts say. But Broad Street is believed to be the city’s largest mail service for people without a home. Along with letters from loved ones, Social Security checks, and packages, guests say the mail service helps them obtain birth certificates and identification, impossible to do without an address. When applying for official IDs or licenses, guests can write in the ministry’s address of 315 S. Broad St. For some, it’s nothing less than salvation. 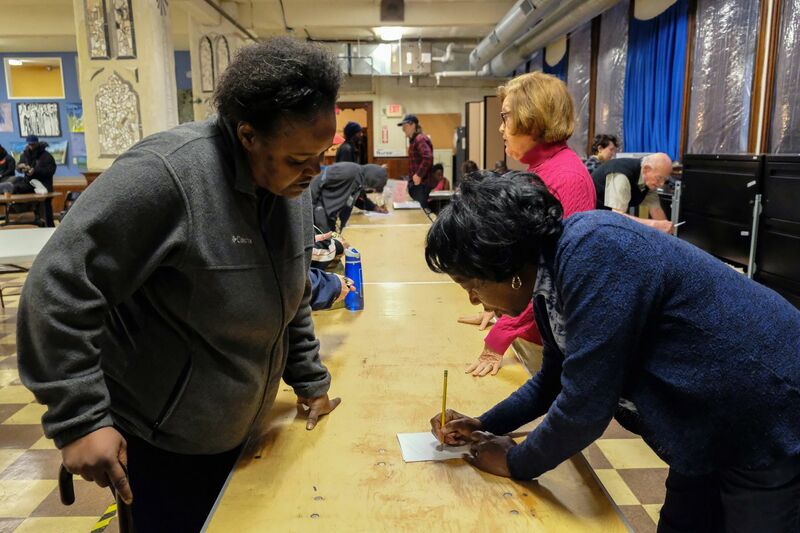 According to a recent survey of people who’ve used services at Broad Street, 33.5 percent said that they had received IDs through the mail that ultimately allowed them to obtain housing. Sixty-four percent said those IDs helped them get benefits. And 33 percent said they were able to use the IDs to land jobs. If you’re somewhere, you’re someone, many of the guests believe. “Getting mail here is one way of proving you exist,” said Brenna McGinnis, a shelter director. “An address gives you the dignity of being able to show that." The ministry mail service is incoming, not outgoing. No guest can buy stamps, or post a package. Collecting mail at Broad Street "is just a good way to stay in contact with your people,” said Adrian Davis, 25, originally from Texas, now living rough in Philadelphia. And, he said, coming into the ministry for mail allows all the folks living outside to check in with street acquaintances and friends as they sort through their letters. “We bounce situations off each other, see where we went wrong, the things we did,” Davis said. Sam Steffen, known as the postmaster general at Broad Street Ministry. A former member of AmeriCorps — a kind of domestic Peace Corps whose members do public-service work — Steffen, slender and youthful in a red flannel shirt, has a master’s degree in theology from Vanderbilt Divinity School in Nashville. A while back, a guest who’d grown anxious about receiving his mail explained that he was awaiting a long-postponed settlement of his parents’ estate. Haley Needle, a volunteer at Broad Street Ministry, sorts mail for homeless people, who are known as "guests." Mike Dahl, executive director of the ministry, said that, initially, he "had no clue how critical this service was.” Now, he understands, and has many of his 3,000 yearly ministry volunteers ensuring that the right envelopes get into the right hands. “Mail is so important,” said Marie Rockemore, 51, formerly a worker in the credit department of a national retailer. Originally from West Philadelphia, Rockemore said memory loss from a severe head injury was one of a cascade of events that pushed her onto the streets. She was at the ministry on a cold spring morning with her husband, Joseph Krips, 69, a homeless man she’d met at Broad Street whom she credits with “protecting me from men when I wanted to be celibate." She said her welfare checks have been delivered to 315. They kept her going. Dean Lloyd, 55, a sad-eyed construction worker from Lewisburg who’s been dealing with an alcohol problem, agreed. “I get forms I need from the welfare office here,” he said, explaining that he’s close to starting a job in a restaurant.